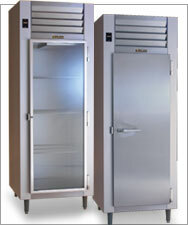 The affordable, available, line of superior commercial refrigeration products. Traulsen’s G-Series product line includes one-, two- and three-section reach-in refrigerator and freezer models, available with either full or half length doors. Plus you can choose from a variety of different door hingings. Dvorson's Ships Traulsen Equipment World Wide: Please contact us for an attractive freight quote! These products are designed to address several important issues facing the foodservice operator today, such as food safety, energy efficiency and reliability. Built with durable exteriors, reliable controls, balanced, efficient refrigeration systems and a variety of user-friendly features, there’s a G-Series that’s the right fit for nearly any application. Designed and built to the highest standards, the G-Series epitomizes the Timeless quality Traulsen is known for. Pans, Adjustable To 2" O.C. • TK4 Kit: Four (4) Pairs of Universal Type Tray Slides To Accommodate Either (1) 18" x 26" or (2) 14" x 18" Sheet Pans, or (2) 12" x 20" Steam Table Pans, Adjustable To 4" O.C. Unobstructed interior for more storage area. The Exclusive Air Flow System moves cool air down across the full width of the cabinet. Dvorson's Ships Traulsen Equipment World Wide : Please contact us for an attractive freight quote! All Traulsen products are available from Dvorson's. Please call for pricing on Traulsen products not shown.